One of our biggest honors and favorite projects for 2009 was building a board that was given as a gift to the President of Liberia, Madame President Johnson. Our amazing friend Pam works with Humanity United, an organization that is making an impact against mass violence, modern day slavery and other atrocities in third world countries, especially in Africa. 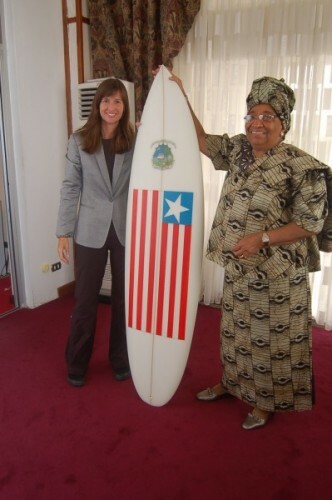 Pam loves surfing and was inspired to give a special board commemorating Liberia to President Johnson as a gift. Steve shaped the board and we painted the Liberian flag and the Seal of Liberia on the deck, so the board could be displayed in President Johnson’s office. Thank you to Jennifer and Leanne for connecting us. Aloha! No Comments on "The surfboard for the President of Liberia"